Details relating to the Luxembourg Commemorative of 2017. The coin commemorates the 200th anniversary of the birth of Grand Duke Guillaume III. The coin is divided into two sections by two vertical lines running from six to twelve o’clock. On the left is the reigning Grand Duke Henri, whose name appears at the bottom, shown vertically. At the top, also shown vertically, is the year of issue 2017.Immediately under Henri is the mint mark. 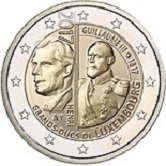 The law of Luxembourg requires that the image of the reigning Grand Duke appear on every coin. To the right of the vertical lines is the effigy of the Grand-Duke Guillaume III. He is wearing the Order of the Golden Fleece on the neck, and the stylized breast stars of the Military Order of William. Around the edge of the inner circle, running from eight to three o’clock (anti-clockwise) is the inscription “GRANDS - DUCS DE LUXEMBOURG”. From twelve to three o’clock is the inscription “GUILLAUME III 1817”. Once again Luxembourg has violated the 2013 ruling that the outer ring is to be reserved for the twelve stars of the EU – any intrusion conflicting with concept of unity within the EU. We see however that between eleven and twelve o’clock a part of the year of issue intrudes. Well done Luxembourg, don’t be cowed by the bureaucrats! This is the eighteenth coin of the Grand Ducal Dynasty series. From Luxembourg Commemorative 2017 to euro coin collector.